Post-medieval bronze vessel rim. The rim has become damaged and broken into two pieces, which have later been joined together. One of the rim fragments has been formed from a flat sheet of metal. The other is also flat, but has a rolled rim proper. The joint has been formed from a commonly found undecorated copper-alloy sheet rivet used to hold repairs to vessels in place. The rivet is of rectangular form having originally been hexagonal. It has been folded in on itself from the sides before being folded back; both wings from the second fold survive. 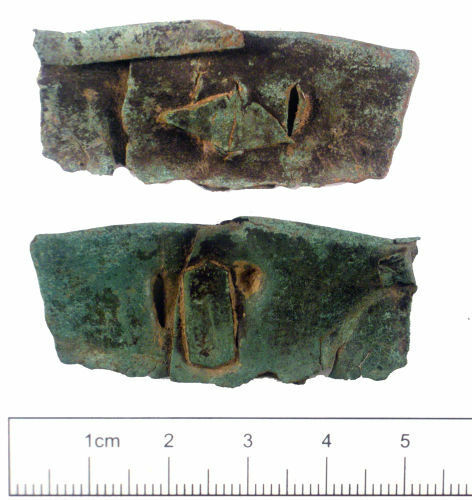 Similar examples found in Norwich tend to be found in post-medieval contexts (Margeson 1993, 92-93; refs. 574, 575).